Juan Foyth was on his own. His back turned toward his team-mates, his face staring at his own goal, the ball at his feet on the edge of the Tottenham box. Mario Gotze and Christian Pulisic swarmed around him like wasps in yellow and black. He had nowhere to go. In one swift movement, Foyth spun away. He knocked the ball between his hungry pursuers, strode through the gap, sprinted away and sprayed a pass out wide. The Tottenham crowd responded with cheers and applause for the 21-year-old, laced, many would admit, with a sigh of reassurance less than five minutes into a game many had been surprised to see the defender start. 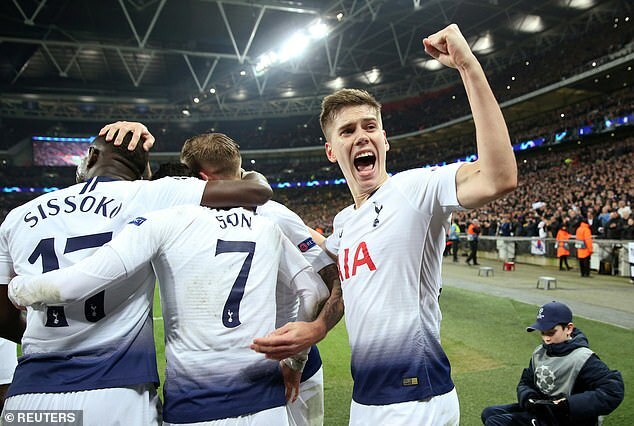 Foyth’s only starts this year have come in the FA Cup. His last in the Premier League was on Boxing Day. His league debut, back in November, saw him give away two penalties. He had to be added into their Champions League squad earlier in the week to enable him to start here at Wembley against Borussia Dortmund. It is not unknown to see young players thrust into the Champions League spotlight but that is usually at the back end of the group stages when qualification is secured and a manager wants to give the next generation a taste of the big stage with little concern for the consequences. Foyth benefitted from such a debut in the competition last season. But this was nothing of the sort. This was the knockout arena, where every result matters, especially for a club that has not passed this stage of the competition since they reached the quarter-finals eight years ago, taking on a team with a five-point lead over Bayern Munich at the top of the Bundesliga. Even for a manager so unshakable in his faith in Tottenham’s youth as Mauricio Pochettino, this was still a massive call on a massive night. Yet here was Foyth, on the right side of a back-three, undaunted, being brave, the embodiment of Pochettino’s bright, young things. There is, however, a fine line between fearless youth and the folly of immaturity. Ten minutes later he found himself in a similar predicament: same position, same opponents. Buoyed by his earlier triumph, Foyth tried to be clever again. This time, Pulisic caught him. Chelsea’s new signing, sent back on loan to Dortmund, stole the ball and fired on goal, only to be denied by Hugo Lloris. 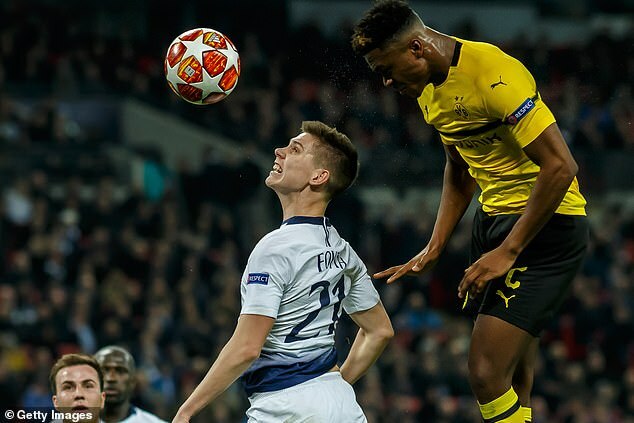 Foyth would need his goalkeeper to come to his aid again, on the stroke of half-time, when the youngster was beaten at the back post by imposing Dortmund full-back Dan-Axel Zagadou only for Lloris to claw the ball back from the goal-line. There was plenty for Foyth to be positive about, though. He stuck out a crucial toe to halt Jadon Sancho’s cut-back into the Tottenham box when danger beckoned. Foyth had the third-most touches of any Tottenham player, the third-most passes with 91 per cent of them finding their intended destination. Three tackles, three interceptions, three dribbles. Yet an error, two fouls and twice dispossessed. Sometimes sloppy, sometimes splendid. The path of inexperience. Whether it’s enough for Foyth to keep his place come the crucial second leg on March 5, who knows. Probably not. Much will depend on the formation and the fitness of Danny Rose, who could only be named on the bench tonight, and whether the quite ridiculous out-of-position performance of Jan Vertonghen in his place at left wing-back, with a goal and an assist, is enough to keep the England defender out the side and free up a space in the centre. Foyth will have to wait and see. For his part, though, he left Wembley with a clean sheet and Tottenham with a huge foot in the Champions League quarter-final.